As our Blessed Mother stood before the Cross of her Son, would “all ages” call that a “blessed” moment? Was she blessed, as she says in her song of praise, to behold the cruel and brutal death of her Son? Though her experience at the foot of the Cross would have been one of exceptional pain, sorrow and sacrifice, it was also a moment of exceptional blessing. That moment, while she stood gazing with love at her crucified Son, was a moment of extraordinary grace. It was a moment through which the world was redeemed by suffering. And she chose to witness this perfect sacrifice of love with her own eyes and to ponder it with her own heart. She chose to rejoice in a God who could bring forth so much good from so much pain. In our own lives, when we face struggles and suffering, we are easily tempted to turn in on ourselves in hurt and despair. We can easily lose sight of the blessings we have been given in life. The Father did not impose pain and suffering upon His Son and our Blessed Mother, but it was His will that they enter into this moment of great persecution. Jesus entered into this moment so as to transform it and redeem all suffering. Our Blessed Mother chose to enter into this moment so as to be the first and greatest witness to the love and power of God alive in her Son. The Father also daily invites each one of us to rejoice with our Blessed Mother as we are invited to stand and face the Cross. Though the Scripture passage cited above recalls words our Blessed Mother spoke while she was pregnant with Jesus and went to meet Elizabeth, they are words that would have continually been on her lips. 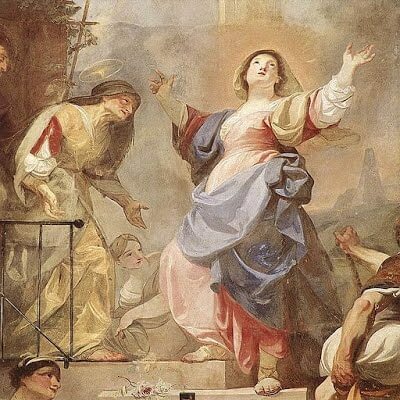 She would have proclaimed the greatness of the Lord, rejoiced in God her Savior and savored her numerous blessings in life over and over again. She would have done so in moments like the Visitation, and she would have done so in moments like the Crucifixion. Reflect, today, upon the words and the heart of our Blessed Mother. Speak these words in your own prayer today. Say them within the context of whatever you are going through in life. Let them become a daily source of your faith and hope in God. Proclaim the greatness of the Lord, rejoice in God your Savior, and know that God’s blessings are abundant every day no matter what you experience in life. When life is consoling, see the blessing in it. When life is painful, see the blessing in it. Allow the witness of the Mother of God to inspire you each and every day of your life. Dearest Mother, your words spoken at the Visitation, proclaiming the greatness of God, are words pouring forth from the great joy of the Incarnation. This joy of yours extends far and wide and filled you with strength as you later stood watching your Child die a brutal death. The joy of your pregnancy touched you, once again, in this moment of deepest sorrow. Dearest Mother, help me to imitate your song of praise in my own life. Help me to see God’s blessings in every aspect of life. Draw me into your own gaze of love to see the glory of the sacrifice of your own beloved Son. My precious Lord Jesus, You are the greatest blessing in this world. You are all blessings! Everything good comes from You. Help me to fix my eyes upon You each and every day and to be made fully aware of the power of Your Sacrifice of Love. May I rejoice in this gift and always proclaim Your greatness.